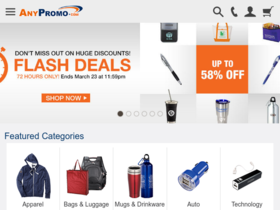 AnyPromo, online at anypromo.com, is the destination for promotional products and personalized gifts. AnyPromo carries apparel, bags, luggage, housewares, mugs, office supplies, pens, pencils, badges, buttons, table covers, banners, posters, lip balm, and more. AnyPromo makes marketing simple. Before shopping at AnyPromo, be sure to stop by RetailSteal.com for the best AnyPromo coupons, AnyPromo discount codes, and AnyPromo deals. AnyPromo also offers shipping promos that change often. Visit RetailSteal.com for the latest AnyPromo shipping specials. Save $15 on orders $100+ at AnyPromo with this code. Save $30 on orders $150+ at AnyPromo with this code. Use code at AnyPromo and save 10% on orders $250+. Use code at AnyPromo and save 10% on education order. Use code at AnyPromo as a repeat customer and save 8% on order. Save 6% on first order at AnyPromo with $250+ purchase and code. Use code at AnyPromo and save 11% on any order. Enjoy free shipping on select items at AnyPromo.